The magnificent trees carry a multitude of pretty daisy like flowers with a bright yellow centre in masses to create a magnificent show. The foliage is an attractive grey-green with an attractive ferny appearance. Our Giant Flowered Marguerite Daisy Trees are supplied as specially trained Standards with a clear stem and blooming head of ferny foliage. 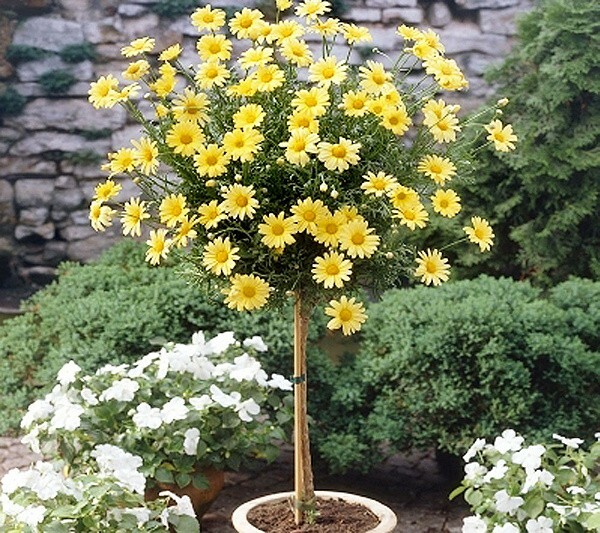 These trees have plenty of buds and flowers forming with an overall height including the pots of around 70cms. Simply plant, position and enjoy!